Gaithersburg-based Sodexo USA and Starship Technologies plan to continue adding campus locations to their food delivery robot partnership. Watch the robots on campus. About two months after food services company Sodexo partnered with Starship Technologies to deploy a fleet of 25 food delivery robots at George Mason University in Fairfax, Virginia, the two have rolled out more robots on the campus of Northern Arizona University in Flagstaff, Arizona. And if the GMU experience is any indication, the NAU students will be eating more breakfast as a result. Gaithersburg-based Sodexo USA said 1,500 breakfast orders have been delivered by the robots since they showed up on the GMU campus in January. 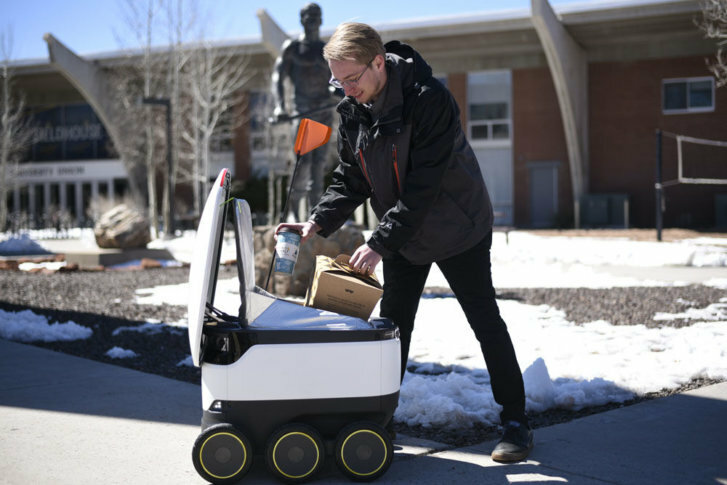 The two companies have deployed 30 of Starships’ box-sized delivery robots at NAU, and partners for delivery include Einstein Bros. Bagels. As is the case at GMU, the food delivery charge is $1.99 and is covered by the school’s student meal plan. In Flagstaff, other food options include Star Ginger and on-campus restaurants Cobrizo Mexican Grill, Turnip the Greens, G’s NY Style Deli, and The Wedge Market and Pizza. At GMU, Subway is the most recent restaurant to sign on to the robot delivery program, joining Blaze Pizza, Starbucks and Dunkin. Sodexo has also extended robot delivery to 2 a.m. and plans to make it 24-hours a day in the near future. Users order through an app and can track the robot’s delivery route. A delivery usually takes a few minutes, depending on the distance. The idea works well for college students. “Today’s college students are prolific users of food delivery apps, and they place a higher value on convenience, ease and diversity of options,” said Sodexo’s Barry Telford. Sodexo and Starship plan to continue adding campus locations to their food delivery robot partnership.